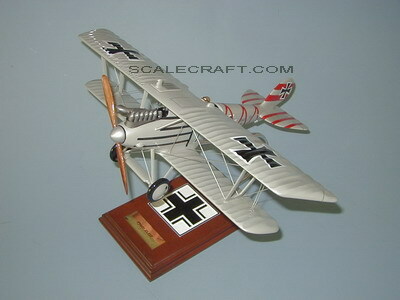 The German Air Force began equipping fighter units with the rugged and reliable Pfalz D.III in August 1917. Together with the Albatros D.Va and the Fokker D.VII, the D.III and the improved D.IIIa, helped revive Germany's air superiority over the Allies. Compared to its contemporary rivals, the Pfalz D.III was not a great fighter, but it was very fast in a dive. It was frequently used to attack and destroy observation balloons with great success. Mahogany Wood. Scale: 1/20. Wingspan 18 1/2 inches, Length 14 inches.